Chicken Cacciatore is a favourite Italian comfort food featuring chicken braised in a hearty tomato and mushroom sauce. 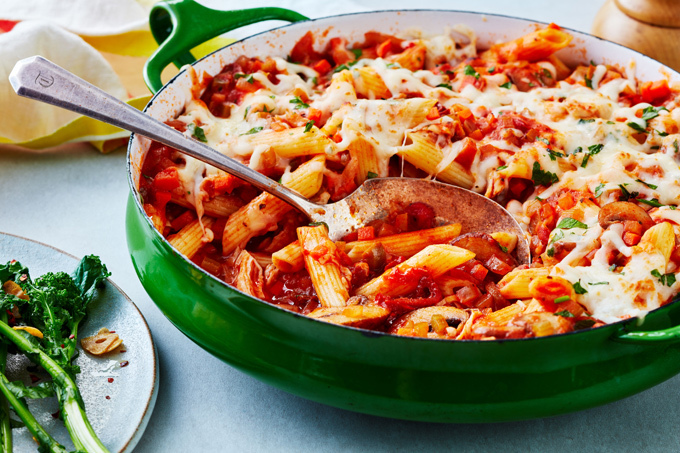 This President’s Choice baked penne recipe cranks up the comfort by tossing it with pasta, topping with a generous handful of cheese and baking the whole thing ‘til bubbly for a fresh take on classic casserole. Recipe reprinted with permission from President's Choice. Arrange chicken in single layer in 13 x 9-inch (3 L) glass baking dish; drizzle with 1 tbsp oil. Bake until no longer pink inside, about 20 minutes. Transfer to cutting board; let cool enough to handle. Shred into bite-size pieces with 2 forks. Set aside. Meanwhile, bring 4 L (16 cups) water to a boil in large saucepan. Add pasta. Stir occasionally until water returns to a boil. Cook until al dente or tender but firm, 11 to 12 minutes. Drain; rinse under cold water until chilled. Drain well. Set aside. Reduce oven temperature to 425°F (220°C). Heat 2 tbsp oil in same saucepan over medium-high heat. Add mushrooms; cook, stirring occasionally, until no liquid remains and mushrooms are lightly browned, 5 to 7 minutes. Transfer to small bowl. Set aside. Heat remaining 2 tbsp oil in same saucepan over medium-high heat. Add onions, carrots and celery; cook, stirring often, until softened, about 10 minutes. Add olives and sun-dried tomatoes; cook, stirring often, 2 minutes. Stir in cooking sauce, broth, passata, salt and pepper. Bring to a simmer; cook, stirring occasionally, until slightly thickened, about 5 minutes. Add chicken, pasta and mushrooms; cook, stirring often, until heated through, about 2 minutes. Transfer to same 13 x 9-inch (3 L) glass baking dish, spreading evenly. Sprinkle with cheese. Cover with greased foil. Bake 30 minutes. Uncover; bake until cheese is golden and sauce is bubbly, 5 to 10 minutes. Let cool 5 minutes. Sprinkle with parsley. Chef’s Tip: Swap out the olives for 1/4 cup capers, if you like. Keep in mind that capers are very salty, so give them a good rinse before adding to the sauce.